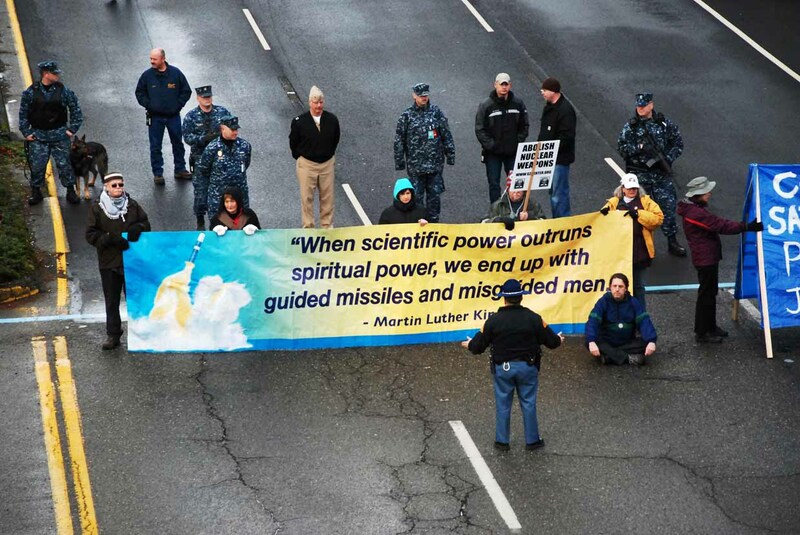 Peace activists occupy nuclear sub base entrance to honor Martin Luther King, Jr.
On January 14, 2012, activists from a local peace group blocked entry to the main gate at the Navy’s West coast Trident nuclear submarine base for nearly a half hour in an act of civil resistance to nuclear weapons. Ground Zero Center for Nonviolent Action held a peaceful vigil and nonviolent direct action at the main gate to Naval Base Kitsap-Bangor in Silverdale, Washington. The group protested the U.S. government’s continued deployment of the Trident nuclear weapons system. Its continued reliance on nuclear weapons as an instrument of foreign policy is in contravention of both U.S. and international laws. The Trident submarine base at Bangor, just 20 miles from Seattle, contains the largest concentration of operational nuclear weapons in the U.S. arsenal. Each of the 8 Trident submarines at Bangor carries up to 24 Trident II (D-5) missiles, each capable of being armed with as many as 8 independently targetable nuclear warheads. Each nuclear warhead has an explosive force of between 100 and 475 kilotons (up to 30 times the force of the Hiroshima bomb). Trained peacekeepers from Ground Zero ensured the safety of all participants during the vigil and action, and communicated with base security personnel as needed. Traffic into the main gate was turned away for approximately 26 minutes. Once Washington State Patrol officers arrived, the protestors complied with the order to move off the State roadway. All were cited for “Pedestrian in Roadway Illegally” (a traffic offense) and released at the scene. Those arrested were Louise Bollman, Larry Kerschner, Gabriel La Valle, Peggy Love, Jack Smith, Carlo Voli, Marion Ward, Robert Whitlock, and Alice Zillah. Arrestees’ ages range from 33 to 73 years. 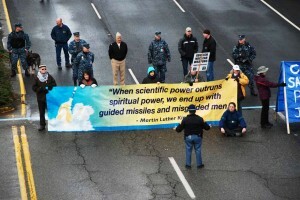 The day planned in honor of Martin Luther King Jr. began in the morning at Ground Zero Center for Nonviolent Action, where participants learned about nuclear weapons effects (with an emphasis on the Trident system) and U.S. nuclear weapons policy. They also participated in nonviolence training and discussed the implications of the Occupy movement in relation to the movement to abolish nuclear weapons. Participants in the vigil and action included activists from the Kitsap Peninsula, Olympia, the Greater Puget Sound area, the Interfaith Peace Walk for MLK Day, and Occupy Seattle. Ground Zero holds three scheduled vigils and actions each year in resistance to Trident and in protest of U.S. nuclear weapons policy. The group has been working to reverse the Navy’s plan to build a Second Explosives Handling Wharf at Bangor. Ground Zero is also working to de-fund the Navy’s plans for a next generation ballistic missile submarine, estimated to cost $99 billion to build.